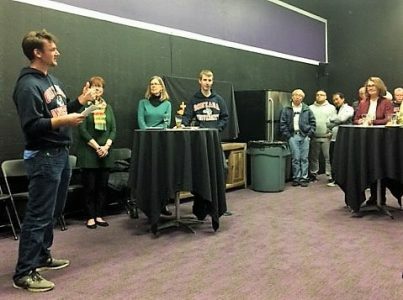 Zac Oldham (Woodburn ’18-19) spoke to a small crowd at an event JVC Northwest held at the University of Portland on January 19, 2019 prior to the UP versus Gonzaga men’s basketball game. Zac is serving at the After School Club in Woodburn, OR. I am a Gonzaga Grad with a mechanical engineering degree and a current JV in Woodburn OR. So you might be wondering, why I would choose a program like JVC Northwest, why would I choose to give a year of my life to service? Well because I was looking for a couple of things that I hadn’t gotten in college. I was looking for a way to grow and experience something I wouldn’t any other way. As my final year of college was wrapping up I wasn’t sure if the engineering field was right for me, so I was looking for a way to experience another field without dedicating my life to it. JVC Northwest offered me that opportunity. I also recognized at the end of college that there were a lot of things about me that I wanted to learn. I wanted opportunities to grow in ways different from what college had provided. I wanted to experience growth in my self-knowledge. Growth in my knowledge of others. And growth in recognizing how both the world works and how I can act in it. JVC Northwest offered me the growth I was looking for. I have one brother. He’s four years older than me, also a Gonzaga grad and when he graduated he chose to join JVC Northwest. So as I was searching for ways to experience the things I wanted, I thought back to what my brother had done with JVC Northwest and as I looked closer I realized that I really liked and wanted to try and live out its four values: community, simple living, social and ecological justice, and spirituality. In college I felt like my community just happened. I somehow ended up living with my closest friends, I hadn’t put much thought in to how that had happened. It was great and those people are some of the people I am closest to, but as I was looking at JVC Northwest I saw it as a way to practice building community in a different way. To be intentional about it and to extend that community in different ways. To reach out to people who are very different from me and to hopefully experience growth through that. I was also ready to set aside parts of my life that I felt pulled me away from what was really important. I wanted to live with others who also put less value on money and status and focused more on those around them. I wanted to lead a simpler life to really let what is important come to the surface. I also wanted to do service that mattered and that would have an impact on others’ lives. I was looking for a way to put in to practice a lot of what I had learned in my 13 years of Catholic education. I wanted to become more aware of and work towards greater social justice for those in need. And in my spirituality I was hoping to grow. I was asking myself questions like how I experience the spiritual, how I express it, and what it means to me. And as I was looking towards a year of JVC Northwest, I saw it as a year to be able to dedicate to asking those questions and gaining some self-knowledge and, I thought, what a wonderful opportunity to experience that with others. So here I am to quickly tell you about the impact that this year has had on me so far: and I will tell you honestly. It has been difficult. Forming my community has been harder than I expected and there have been times where I feel I do not fit in at my service site. I tell you it has been difficult and that’s to illustrate how I have put myself into an uncomfortable situation. I chose to be placed with several strangers in a strange town with a population very different from what I grew up with, and I chose to try to live by these values that are very different from the norm. And that is a large part of what JVC Northwest is about. It is about practicing being uncomfortable. It is about becoming, through these situations, more aware of the world around you. And about encountering different perspectives in order to become more aware of yourself and how you fit in to the world around you. And what is amazing about JVC Northwest is that you don’t go through those difficulties alone. You live with others going through the same things. You have support from the JVC Northwest program coordinators and the amazing support people in your locales. And from a wider community of former JVs and other helpers. And it is just amazing to have that network of support. Congrats Zac!! Not your typical engineer talk. Great for b-ball fans who love all things GU & UP. Thank you for spreading the word —- great recruiting and support building. As a JV from 1968 & 69, it kindled a generous helping of nostalgia and hope!